Hi friends! I hope you're having a great day! We had a great time today! We went to a Valentine's party with my mommy group friends who I've known since Brady was only 5 weeks old. It's amazing how much our kids have grown! I adore my friends and their sweet kids. It's always fun to have a holiday party with them! Speaking of Valentine's Day, I wanted to join in the Valentine's Day blog hop over at the Dancing in Pajamas Blog. 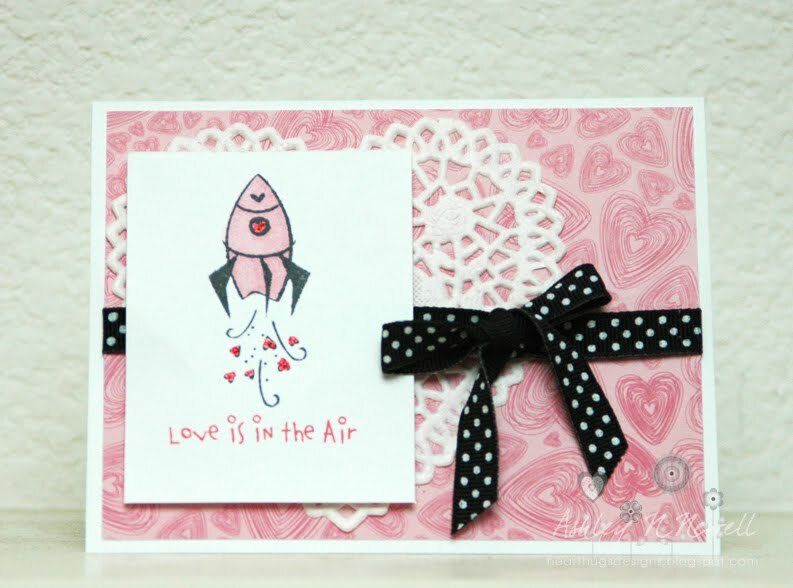 I love The Cat's Pajamas and how better to celebrate Valentine's than to make a cute TCP card? I can't think of a better way! Here's a card I made with an older TCP set that I have. I think this rocket card is perfect for my little guys. They LOVE rockets and space! For this card I used the CPS 5th Anniversary Day 12 Challenge. The paper is Bo Bunny, the doily is from Target, and the ribbon is from L'il Davis. I colored with Copics and added some Stickles. So, so cute! I love that image!